Greenville and Tyler, TX drivers looking for a tough and rugged SUV with the off-road capability of a Jeep, you want the 2015 Grand Cherokee. Whether you want it for the ruggedness or the luxuriousness, Sulphur Springs Chrysler Dodge Jeep Ram is the dealership that will help you find the perfect Grand Cherokee for you. The Jeep Grand Cherokee returns for 2015 just as tough as ever. Powertrain choices range from a 3.6-liter V6 with 290 horsepower, a 5.7-liter Hemi V8 with 360 horsepower, or a 3.0-liter V6 turbo-diesel with 240 horsepower. The diesel V6 is the torque champ of the lineup with 420 lb-ft., 30 more than even the Hemi V8. An eight-speed automatic gearbox links up to all three engines and is the only drivetrain option. It wouldn't be a Jeep without several 4WD options. Buyers can choose from Quadra-Trac I, Quadra-Trac II (with low range), or the sophisticated Quadra-Drive II with electronic limited slip differential. A gas V6 Cherokee is rated at 25 mpg highway while the diesel V6 is rated at 30 mpg. A properly equipped V8 Grand Cherokee can tow 7,400 pounds without batting an eye. For 2015, there are five trim levels starting with the Laredo. 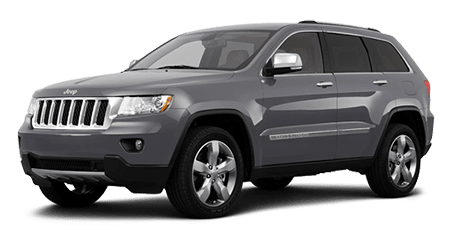 The Grand Cherokee Laredo comes standard with all power accessories, AC, cruise control, tilt and telescoping steering, automatic headlights, keyless ignition, 17" alloy wheels, and push-button ignition. A six-speaker stereo with 5" touchscreen, Bluetooth, iPod/USB/aux input and CD player is also included. Move up to the Grand Cherokee Altitude, and you get 20" wheels, a power liftgate, heated suede seats, and an 110-volt power outlet. The Limited trim comes with 18" alloy wheels, special chrome trim, heated rear seats, a rearview camera and parking sensors, and upgraded sound system with nine speakers. Limited buyers can also add two different off-road packages or a Luxury package. The Overland trim level gets 20" wheels, automatic wipers, auto-dimming HID headlights, panoramic sunroof, a tow package, and the 8" Uconnect touch screen system with navigation. Both Overland and Limited grades have the option of the Advance Tech package with adaptive cruise control, blind-spot and cross-traffic monitors, and other electronic safety systems. The highest trim grade is the Summit, which includes special 20" wheels and unique trim, plus real wood accents inside, active noise cancelling, all the Advance Tech options, and a 19-speaker Harmon Kardon sound system. Rear-seat video entertainment system and tow package are standalone options on most models. Don't think you can drive a luxurious vehicle off-road? Think again, because the 2015 Jeep Grand Cherokee is an off-road master with all the luxury trappings. Come out to Sulphur Springs CDJR in Hopkin County, TX and let us show you how nice a rugged Jeep can be.